Many factors go into water requirements for lemon trees. 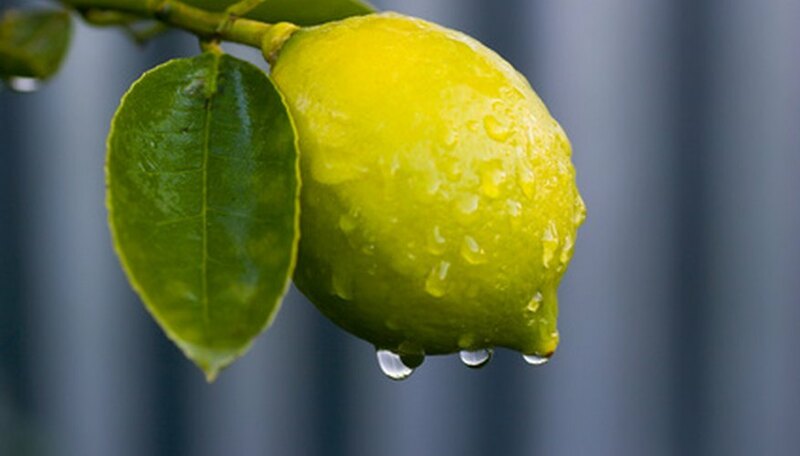 At different times of the year, lemon trees require different amounts of water, and these requirements also hinge on other factors such as size and location. If your lemon tree does not get enough water (or if it gets too much), then it may fail to bloom or produce fruit, so make sure that your lemon tree is getting just enough--but not too much--to drink. Watering your lemon tree helps the tree convey nutrients to all parts of the plant. It also results in firm, tasty fruit. Because most lemon trees are not grown in their native habitats, you will have to give your tree water in addition to rain to make sure it is being adequately hydrated. Lemon tree water requirements are based largely on canopy size. The canopy is the leafy top part of the tree. You can reference a guide to watering citrus trees based on canopy size at http://ag.arizona.edu/pubs/crops/az1151.pdf. You should add 20 percent more water to the amount indicated in the chart to make the water volumes appropriate for lemon trees. In the winter, lemon trees need to be watered only every few weeks if no rain has fallen during this time. During the summer, potted and domestic lemon trees (under 6 feet in most cases) will need about 5 gallons of water per week. Larger outdoor trees will need much more, and you should refer to a professionally derived citrus care chart to get exact measurements. However, you may have to moderate these measurements based on the weather because if you get a lot of rain, watering your tree could contribute to root rot. Container-bound lemon trees need watering two to three times a week in early spring, and daily watering in the hot summer if they are in a small container. While lemon trees do not like to be drowned, their root ball must be saturated. This is true whether they are growing in a pot or in a garden. The soil should be kept moist, but not soggy, and you should check the soil around the roots for moisture before watering even if the top layer of soil is dry. Water your tree thoroughly and deeply when you water rather than sprinkling it each day. Try to water your tree in the morning, although if it is looking wilted do not wait until the next day to act. A young tree (one with a trunk less than an inch in diameter), will likely need to be watered two to three times a week during the summer, and once a week in the fall and possibly into the winter, depending on the weather. Older trees (more than 1 inch in diameter) can do with less frequent, deeper watering because their roots are deeper in the ground.